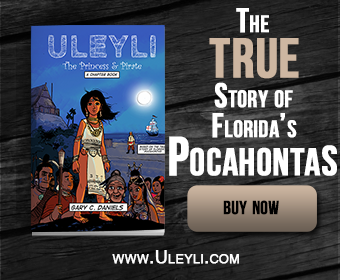 Editor’s Note: The Spanish chroniclers of the first European expeditions in Florida and the southeast made constant mention of the skill and accuracy of Native American archers. It’s clear from their writings that they both feared and greatly respected these expert marksmen and warriors. The following account comes from Florida of the Inca by Garcilaso de la Vega. …Captain Pedro Calderon and his 120 companions made their daily marches until they came to the great swamp, without anything noteworthy happening to them, except that one night before they reached the swamp, when the Castilians had camped on a plain near some woods, many Indians came out to make sudden attacks and sallies against them at all hours, until they came into the camp itself and fought hand to hand. When the Spaniards pressed them they ran back to the woods, and then came out again to molest them. In one of those engagements one of the riders assailed an Indian who showed himself to be more daring than the others. He ran from the rider, but when he felt that he was overtaking him, he turned to receive him with an arrow in his bow, and he shot it at such short range that at the same moment the Indian loosed the arrow the Spaniard gave him a lance thrust from which he fell dead. But he did not avenge his death badly, because the arrow he shot entered the horse’s breast, and though he was so close, the shot was so true that the horse fell dead at his feet, with all four legs outspread and without making another step or movement. Thus the Indian and the horse and its master all three fell at once, one on top of the other. This horse was the famous one belonging to Gonzalo Silvestre, and all his excellence was not enough to make the Indian respect him. The Spaniards, wondering how an animal so spirited, fierce and brave as a horse could have died so suddenly from the wound of only one arrow, shot at such close range, as soon as it was light desired to see what kind of shot had been made. They opened the horse and found that the arrow had entered the breast and passed through the middle of the heart, stomach, and intestines, stopping finally in the latter; so bold, strong, and skillful in shooting arrows are the natives of this great kingdom of La Florida generally. But this is not to be wondered at if it is remembered that they exercise themselves continuously in this at all ages, for the boys of three years or less, as soon as they can walk alone, impelled by their natural inclination and by what they constantly see their fathers do, ask them for bows and arrows. If they are not given to them, they themselves make them from such small sticks as they can find, and proudly stalk the vermin in their houses. If they can catch sight of a mouse or lizard entering its hole, they will wait three, four, or six hours with an arrow in their bow, watching with the greatest attention that can be imagined for it to come out, in order to kill it, and they do not rest until they have accomplished their purpose. When they can find nothing else at which to shoot they go about killing the flies that are crawling on the walls and the floor. With such continual practice and the habit formed therein, they are thus skillful and cruel in discharging arrows, with which they make most wonderful shots, as we shall see and note in the course of this History. Because it fits in here it will be well to tell of an event that took place in Apalache, where the governor had remained, for when we come to that province we shall not lack things to tell about the bravery of its natives. Thus it was that in one of the first skirmishes the Spaniards had with the Indians of Apalache the maese de campo Luis de Moscoso received an arrow wound in the right side, which passed through a buckskin jacket and a coat of mail that he wore beneath it, which because it was so highly burnished had cost i So ducats in Spain. The rich men had brought many of these, because they were so highly regarded. The arrow also passed through a quilted doublet and wounded him in such a manner that, entering obliquely, it did not kill him. Amazed at such an unusual shot, the Spaniards wished to see just what their highly burnished coats of mail, upon which they had depended so much, could withstand. On arriving at the pueblo, they set up in the plaza one of the baskets the Indians make of reeds, resembling vintage-baskets, and having chosen the best coat of mail that they had, they put it over the basket, which was very firmly woven. Taking off the chains of one of the Apalache Indians, they gave him a bow and arrow and ordered him to shoot at the coat of mail, which was fifty paces away. The Indian, having shaken his arms with his fists closed in order to call up his strength, shot the arrow, which passed through the coat of mail and the basket so clean and with such force that if a man had been on the other side it would have passed through him also. Seeing the little or no protection that one coat of mail gave against an arrow, the Spaniards wished to see what two would do. Thus they ordered another, very fine one to be put on over the one on the basket, and giving the Indian another arrow, they told him to shoot it as he had the first one, to see if he were man enough to shoot through both of them. The Spaniards were unwilling to grant the Indian’s request because they did not want their coats of mail further mistreated, and thenceforth they were undeceived with regard to the little defense that their much-esteemed coats of mail afforded against arrows. Thus the owners themselves made fun of them, calling them linen from Flanders, and in place of them they made loose quilted jackets, three or four finger-breadths in thickness, with long skirts that would cover the breasts and haunches of the horses. 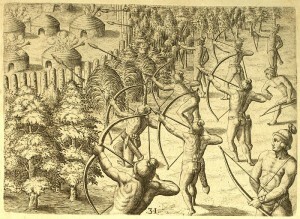 These jackets made from blankets would resist the arrows better than any other defensive armament; and the thick and unpolished coats of mail, which were not highly valued, with some other protection they put under them, were a better defense against arrows than the very elegant and highly burnished ones. Thus the cheaper ones came to be more valued and the expensive ones laid aside. Other very notable shots that were made in the course of this discovery we shall mention below in the places where they occurred, and certainly they are amazing. But after all, considering that these Indians are born and bred in the midst of bows and arrows and brought up and nourished on what they kill with them, and are so expert in their use, there is no reason for our marveling at it so much….